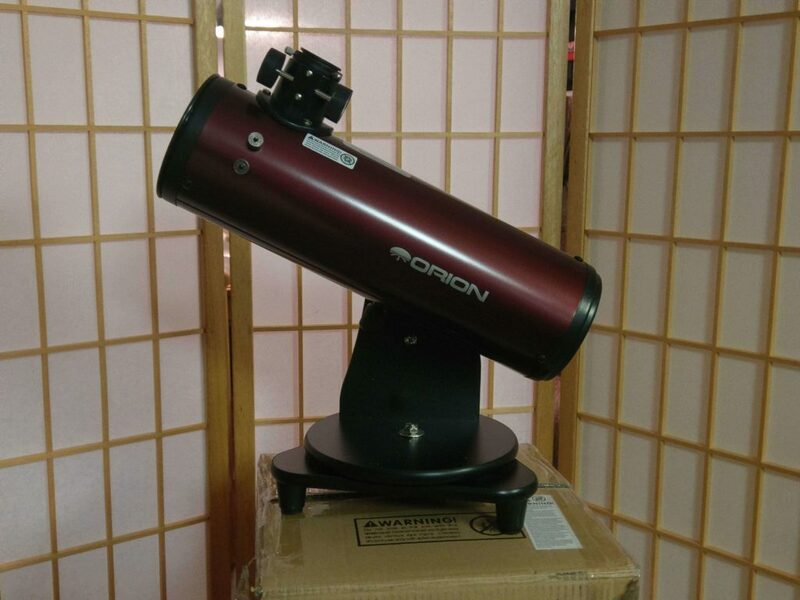 The Orion SkyScanner 100 is a compact Newtonian reflector telescope with a 100 mm aperture. It has a 400 mm focal length for a focal ratio of F4. Being small and light it is a real grab and go telescope. The Orion SkyScanner 100mm is shipped in a doubled box to protect it during shipping and I have to say it was well packed. I would suggest you save the box so you can pack the telescope and toss it in the car for vacation travel. You could also put it in checked baggage for air travel in this box. If you don’t have some protected place to store it, remove the finder and put the SkyScanner 100 back in the box. However, I think this attractive little red scope would look great on a bookshelf or displayed in plain sight. It would make a great conversation piece when it is not gathering starlight. When it arrives it is already assembled and mounted on the base. The only assembly required is the attachment of the finder. This takes about a minute. Fully assembled the SkyScanner 100 weights a mere 6.2 pounds which could easily be handled by a child or preteen. The intention is that you place this on a table, stool or some other suitable stand so it is at a comfortable height. It is light enough that even a sturdy box could serve as a base. Just make sure that it is rock solid steady. I have seen reports of people using it on the hood of their car or placed on a large rock when camping. Just remember that, if the base moves, the image in the eyepiece will show it, so be sure it is stable. The included mount is a tabletop Dobsonian style mount. If you are not familiar with the Dobsonian design, it operates like a Lazy Susan turntable that you might have on your dining room table. The optical tube hangs from an arm using a standard dovetail bar. It pivots on the arm for up and down movement. You have a tension adjustment dial on the side so you can firm up the friction on the altitude pivot, up and down, so the optical tube stays in place. This will be especially helpful if you buy additional eyepieces that are heavier than the ones that come with the telescope. The base rotates left and right so it is classified as an altitude/azimuth or AltAz mount. Since the motion is smooth, following targets should be no problem. Normally the SkyScanner 100 is used on a table or stand of some type. However, on the bottom of the base is a standard ¼ 20 attachment point which will allow you to place the entire unit on a photo type tripod or any other kind of tripod or stand that accepts ¼ 20 devices and can support the scopes 6-pound weight. Orion also provides a second mounting option, one I intend to take advantage of from time to time. You can remove the optical tube from the Dobsonian mount with the twist of a knob and slide the dovetail out of the slot. In the center of the dovetail is another ¼ 20 mount point so you can attach just the optical tube to the photo tripod. The optical tube alone only weighs 3.4 pounds which should be well within the weight range of most camera tripods. If you are traveling and normally bring a camera tripod with you, just pack the optical tube in your bag and use it on the camera tripod. This might make this a great travel scope for airline trips. It is small enough to put in your carryon luggage. Little details like these ¼ 20 mount points are very thoughtful and useful and not something you typically see in a telescope package at this price. 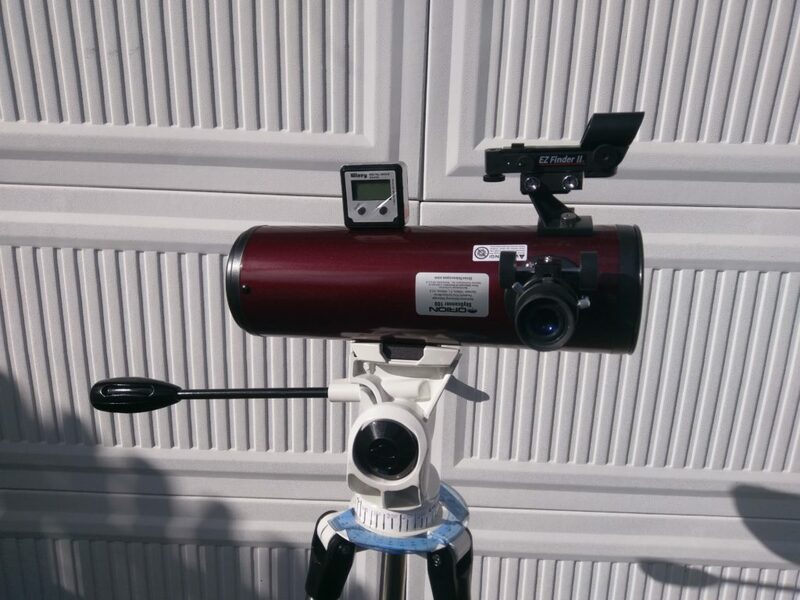 In fact, many entry-level telescopes are attached to their mount in such a way that the optical tube cannot be used on any other mount but the one included in its package. Orion has built to standards that give you flexibility in how you use the telescope. 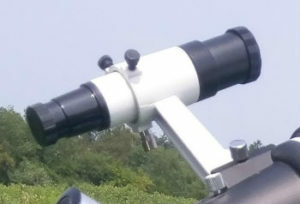 A third mounting option is provided by the fact that the optical tube is attached to the table top Dobsonian mount with a standardly sized dovetail. This also allows you to shift the optical tube forward or back to improve balance if you are using heavy eyepieces. However, if you have another telescope mount that takes a standard dovetail attachment you can remove the optical tube from the tabletop mount and use it on your other telescope mount as shown in the photo. I placed the optical tube on the mount for my 80 mm refractor just to see how well it would work. The dovetail was a perfect fit! When mounted on the included Dobsonian mount the eyepiece is at the top which works well for a tabletop. However when on a tripod the eyepiece is at the side, taking advantage of your ability to adjust the height of the tripod. Normally a Newtonian reflector telescope has a way to adjust the primary mirror to get the optics aligned in a process called collimation. And the primary mirror would normally have a center spot as an alignment target for this collimation process. They SkyScanner 100 does not have provisions for adjusting the primary mirror and the mirror is not center spotted. It is collimated at the factory and fixed in place. Reports I have read suggest that this holds collimation well over the years. There is a document on the Orion web site that explains how to collimate the scope at the secondary mirror. Using this document I checked the scope’s collimation. It appeared to be on the money. A defocused star test also showed that the scope was properly collimated. As there is no center spot on the primary mirror there was no reference point to do a precise confirmation, but it looked good. The SkyScanner 100 comes with two eyepieces. These appear to be Kellner type designs at 10 mm and 20 mm. The 20 mm provides 20X and the 10 mm provides 40X. Testing shows these to be well matched to the scope giving the new owner a good starting point to scan the sky. 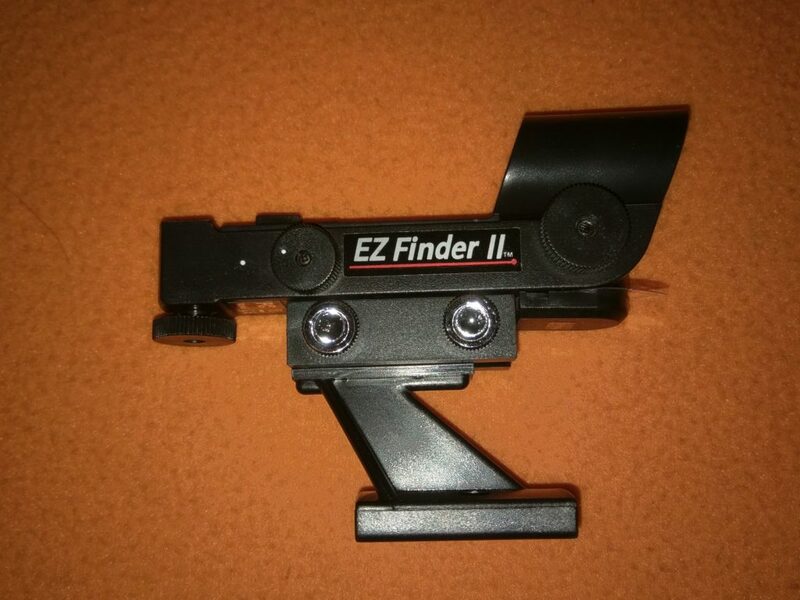 Also included is an Orion EZ Finder II red dot type finder. This is the only part of the package that has to be assembled and it is a simple matter of removing two knurled nuts on the optical tube, slipping the finder over the studs and tightening them back on. Orion could have gone cheap on the mounting hardware and gone to plastic, but they didn’t. The finder mounting studs and the knurled nuts are metal for a strong mount and long life. 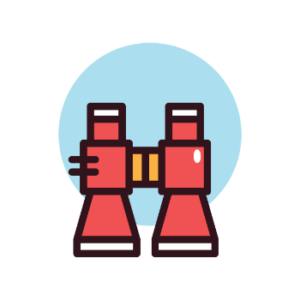 Don’t forget that the finder must be aligned with the telescope. This is best done during the day before you take it out under the stars. The focuser is a rack and pinion type. It works smoothly but was quite stiff when I first used it. Now that I have had it out a few times it seems to be loosening up a bit. Still, the teeth on the rack are fairly course making it a bit challenging to achieve precise focus at higher magnification. This will be a limiter on the high magnification range of the scope. There is not much in the way of instructions in the box. But Orion provides a glossy quick start guide that has links to the Orion site where you can find an online manual for their tabletop scopes. There is also a document on collimation of scopes with fixed primary mirrors. As the name implies, the SkyScanner 100 is very well suited for scanning the sky. The short focal length produces great low power wide field views with the included eyepieces. I would highly recommend using the SkyScanner 100 for scanning the Milky Way if it can be seen from your location. If you started your journey into astronomy using binoculars and this would be your first telescope you will enjoy having this wide field of view capability. If you were to add a 25 mm Plossl eyepiece to your eyepiece set you would get a view as wide as 3 degrees which is wide enough to take in almost all of the Andromeda Galaxy. Most telescopes cannot do this. Star clusters like the Pleiades, the Hyades cluster, the Dragonfly, the Double Cluster, the Sailboat Cluster and so many other low to medium power deep sky objects will look wonderful. The Coathanger star cluster, one of my favorite binocular targets, would be outstanding with this telescope. Using the included 20 mm eyepiece you get 20X and approximately a 2-degree field of view. This combination will work well for star hoping to find a wide range of targets. The included 10 mm eyepiece provides a 40X image and about 1-degree field of view. This will work well for the Moon, Venus, and open clusters. If you want to go higher in magnification for Mars, Jupiter, Saturn, globular clusters and the like you will need shorter focal length eyepieces or a Barlow lens. A 3X Barlow would work quite well with the included eyepieces as it would take the 20X eyepiece to 60X and the 40X eyepiece to 120X. That would give you four magnifications which would be plenty for most targets and should match up well with the Skyscanner’s capabilities. You will be able to see the moons of Jupiter and the main cloud bands. You should also be able to see the rings of Saturn. By adding the suggested Barlow lens, at 80 to 120X you should also be able to see the great red spot on Jupiter. There are hundreds of bright open star clusters you can enjoy within the power range of the SkyScanner 100. And you can split double stars like Albireo, Mizar, and others. 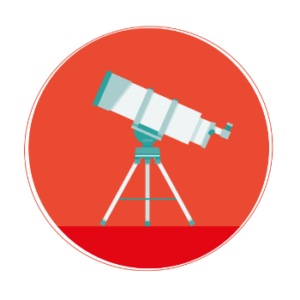 Showcase targets like the Orion Nebula will be wonderful in the SkyScanner 100. I spent several evenings out with the SkyScanner 100 to test the optics and trying it with different eyepieces. Unfortunately, the planets are not in my night sky at this time so I was not able to do specific tests on them. The Orion Nebula – As a very familiar deep sky object, I know what to expect. At 40X, using the included 10 mm eyepiece, I was able to resolve the four stars of the trapezium. I was pleased with that result. Using my 2X Barlow I was able to move in closer at 80X. Messier 3 – On a night with a nearly full Moon, I wanted to try a more difficult target. I used the SkyScanner to observe Messier 3, a globular cluster in the constellation of Canes Venatici. I selected M3 because this can be a challenging target when the Moon is bright, but the SkyScanner did a good job. I had the image up to 80X using the 10 mm eyepiece with my 2X Barlow. The Moon – Using the SkyScanner 100 on the Moon produces great results with the included eyepieces. The image is clean and sharp. Again I used the 10 mm with my 2X Barlow to observe the Moon. I had good surface detail and the edges of the moon were crisp with no chromatic aberration. The Moon is usually the target that I can get the highest magnification and still have a good image. That is because it is close and so bright. So I took it up to 149X using a 2.5X Barlow and an Explore Scientific 6.7 mm 82 degree eyepiece. The image was pretty good but getting into precise focus was difficult. The focuser does not do well when fine adjustments are needed, as is required at high magnification. So I am going to say that I feel the scope tops out somewhere around 150X for this reason. A characteristic of Newtonian reflectors is that if you take the magnification down too low you may begin to see the image of the secondary mirror in the field of view. According to the Orion website the scope should be able to go down to about 14X which would be about a 28 mm eyepiece. I tested with a 32 mm Plossl which is what I would normally use to maximize the field of view. The 32 mm provides 12.5X. Sure enough, there was a very distinct dark area in the middle of the field of view. I would not recommend using an eyepiece of less than 25 mm in focal length, 16X, or you risk seeing the secondary mirror. A 25 mm Plossl would provide a very nice 3-degree field of view. I have also tested the SkyScanner 100 with other eyepieces including my Explore Scientific 14, 8.8 and 6.7 mm eyepieces. All worked well in the little scope. 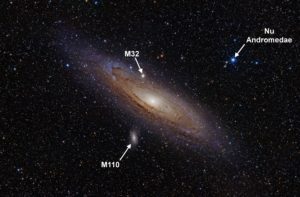 The Messier List is a popular first observing list with new telescope owners. If you can get to a moderately dark location the SkyScanner will likely be able to show you most of the 110 targets on the Messier List. So, where would the Skyscanner 100 not be a good fit? If you are focused on detailed planetary observing, this requires very high magnification, preferably over 150X. The SkyScanner 100 would not be a good choice for you. If you are splitting difficult double stars where high magnification is essential, this scope would not be a good choice. Dimmer deep sky objects require all the aperture you can get. 100 mm is not bad but to see those dimmer items you are going to want more aperture. This is why many amateur astronomers have more than one telescope. They may have one for the low power wide view targets. Here the SkyScanner can fill the bill. Then they have a larger aperture scope, perhaps 200 mm or larger, to go after those dimmer targets or the ones needing high magnification. To summarize this review of Orion Skyscanner 100mm table top telescope, this is a very cute little grab and go tabletop scope. It won’t compete with the larger, more expensive scopes but, with the addition of a 3X Barlow, it should be a great little grab and go scope. It might also be appropriate for a preteen looking for their first telescope. I would give it 3.5 stars out of 5 with the focuser being the main detractor and the need to add a table or stand to use it. A tripod mounted scope might be a more convenient option for many people. When you take into account the cost of adding a Barlow lens to reach higher powers, a possible alternative choice would be something like the Meade Infinity 80 mm or 90 mm refractors. These are tripod mounted refractors with similar light gathering power which do not require a table and they include a Barlow lens in the package.